Primary source materials are often found at home in the form of photographs, letters, diaries, and home movies. However, they are not always recognized as being a primary source. Use the examples, questions, and guides on these Web pages to engage students in discovering primary source materials. Have them look at home, in local institutions, and on the Web for interesting artifacts that they can share with the entire class. Click on Photographs, Documents, Maps, Motion Pictures, or Sound Recordings to begin. Primary Source - original works in various media formats such as photographs, drawings, letters, diaries, documents, books, films, posters, play scripts, speeches, songs, sheet music, and first-person accounts that are recorded at the time of an event. Secondary Source - source created by someone either not present when the event took place or removed by time from the event. Examples of secondary sources include textbooks, journal articles, histories, and encyclopedias. The activities were designed by Linda Joseph, American Memory Fellow (1997), Summer Institue Staff Member (1999-2001), and Educator in Residence (1999) at The Library of Congress. Teachers can use these as an introduction to a variety of primary sources. 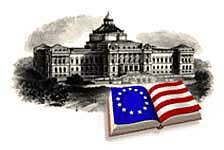 In words, pictures, and sounds the Library of Congress American Memory collections ...bring living history into our classrooms. For more ideas and activities that you can do with your students visit the Learning Page.